Starting today, we examine all 32 teams’ training camps to date, kicking things with the AFC North. ESPN’s Jamison Hensley reports that receiver Michael Crabtree “has been a popular target” during red-zone drills in camp. With rookie Lamar Jackson breathing down his neck, one area quarterback Joe Flacco simply needs to improve on is his red-zone efficiency, as he ended the 2017 season with an adjusted completion percentage of just 59.4 percent on his red-zone attempts, which ranked 31st of 36 qualifying signal-callers. 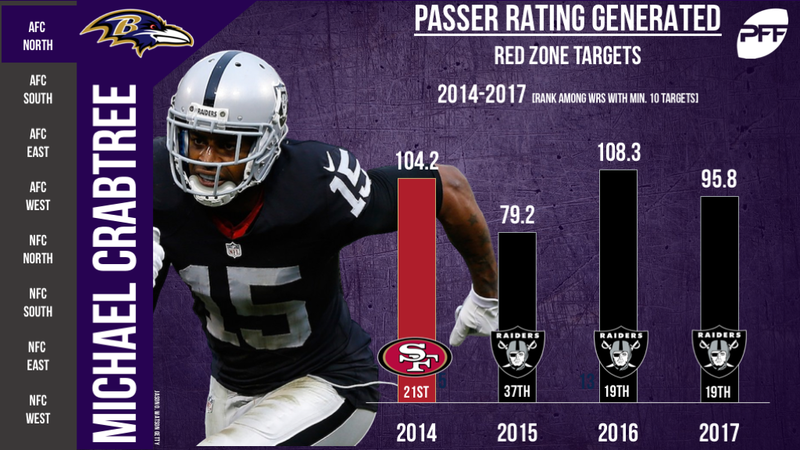 The veteran Crabtree seems like the obvious target for Flacco as he’s been solid in the red zone over the last several seasons and notably generated a passer rating of 95.8 on his red-zone targets last year, which ranked 19th among receivers with at least 10 targets. The Bengals have announced that guard Rod Taylor is out for the season with a torn ACL. Taylor was a seventh-round pick out of the University of Mississippi and played right guard as a freshman and sophomore, left tackle as a junior and right tackle during his last year. Taylor showed improvement every year of his college career but really shined bright last season and ended the campaign with an overall grade of 82.4, which ranked 46th of 316 tackles in the nation. The Bengals will miss his versatility along the line and with Taylor out, Cedric Ogbuehi (56.6 offensive grade) and Bobby Hart (44.8 offensive grade) will compete for snaps in his stead. According to reports, Browns head coach Hue Jackson reiterated Monday that Tyrod Taylor will remain the team’s starting quarterback. No. 1 overall pick Baker Mayfield is still yet to throw an interception at camp and has impressed spectators during team drills, but Jackson remains steadfast in his plan to bring him along slowly. Taylor will be an instant upgrade to the team, especially in third-down situations, which is where the team really struggled last year. 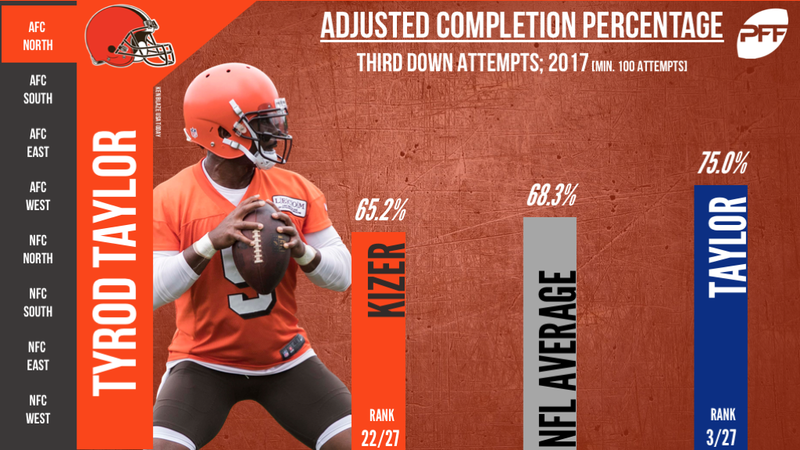 In 2017, Deshone Kizer’s third-down adjusted completion percentage of 65.2 percent ranked 22nd among 27 qualifying quarterbacks, while Tyrod Taylor put up an adjusted completion percentage of 75.0 percent on this third-down attempts last year, which is not only nearly 10 percentage points higher than Kizer, it was the third-best mark in the league. It has been reported that starting left guard Ramon Foster will miss four to five weeks with a knee injury. Foster has been as dependable as they come since he entered the NFL and has played 87.7 percent of the team’s offensive snaps in that span. With Foster out, B.J. Finney would likely be the next man up. Last year, Finney logged 95 pass-blocking snaps in seven games while backing up both left guard and center, and he allowed just two quarterback hurries while doing so.